Twenty years on, The Paper captures a particular ’90s flashpoint. It simultaneously represents a time when Michael Keaton was a leading man, when Ron Howard was better-known for his comedies than his prestige pictures, when David Koepp was one of Hollywood’s hottest screenwriters, and when a print newspaper’s scrappiness could be determined by its relationship to a richer, more successful newspaper rather than its very existence. 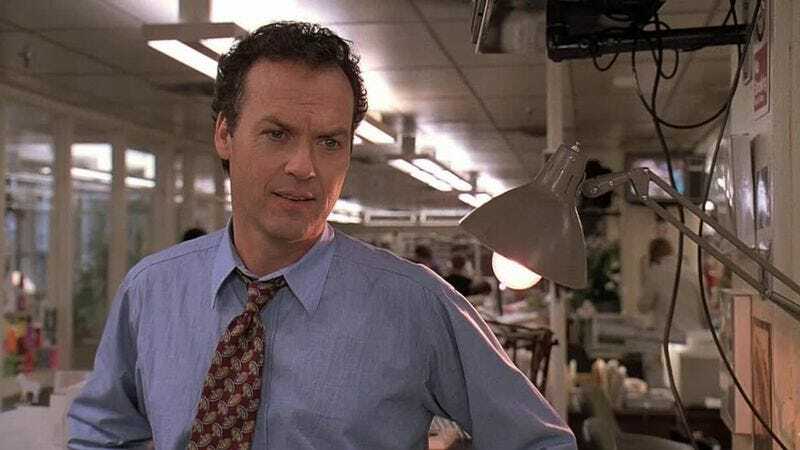 Howard’s film, one of his best, follows exactly 24 hours in the life of Henry Hackett (Michael Keaton), an editor at the New York Sun (loosely modeled after the Post), as responsibilities pile up. He’s got a job interview at the competing Sentinel (a broadly drawn Times spoof); his wife Marty (Marisa Tomei) is about to give birth; his boss Bernie (Robert Duvall) has cancer; the Sun’s managing editor Alicia (Glenn Close) pinches pennies; and, throughout all of this, a breaking story about a couple of teenagers arrested for a grisly murder isn’t sitting right with him. Howard’s camera bustles through the newsroom, catching snatches of fast-talking dialogue and running gags. Hackett isn’t the final decision-maker at the Sun, but Keaton commands attention because he talks the fastest—he has a way of making stammers and half-sentences sound like the product of a brain that can’t keep up with its meager human mouth. The movie creates symphonies of chatter around him: There’s one in person, with ornery reporters swarming around Henry’s office, and another conducted through a multi-line series of phone conversations, aggressive jamming of the hold button serving (along with the editing) as punctuation. The phone scene culminates with a glorious New York kiss-off—one of Keaton’s finest on-screen moments. As the frequent pans over to clocks and pitilessly time-jumping cuts indicate, the whole movie is a ticking clock, one extended evocation of a looming deadline. If its subplots sometimes trip into melodrama, at least their urgency supports this broader theme. The Paper also undercuts any potential self-importance by refusing to glamorize reporting, even when reporters try to do some good. Instead, Koepp and his co-writer brother, Stephen, depict the job as an unwieldy mélange of luck, teamwork, bumbling, needling, and sometimes plain old underhandedness. In its nitty-gritty, human-scale professionalism and dashes of family drama, The Paper hits a midpoint between Parenthood and Apollo 13 (not coincidentally, two more of Howard’s best films). It’s a pillar of mid-’90s studio craftsmanship. Availability: The Paper’s DVD release is pan-and-scan only, but it’s available in the proper aspect ratio through the various digital rental and download services.